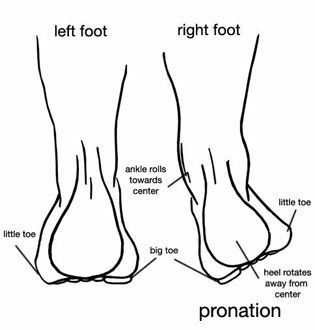 Pronation is abnormal motion in the joint that sits below the ankle joint. This joint it's responsible for allowing your foot to adapt to uneven surfaces. Pronation is abnormal motion in the joint that sits below the ankle joint. This joint it's responsible for allowing your foot to adapt to uneven surfaces. When it is working right it keeps all the other joints in the middle and back of your foot correctly aligned. It also allows the foot to act as a shock absorber. When it is not working correctly it allows the foot to become floppy and causes over stretching of the inside of your foot and a drop in your arch. It also allows the bigger joints in the foot to become misaligned. These changes cause further problems to develop including bunions, hammertoes, plantar fasciitis, early arthritis, ankle, leg, hip, and back pain and the list goes on. Treating pronation involves supporting the arch of the foot with prefabricated or custom made insoles. Proper shoes also help. For severe cases a foot-leg brace known as an AFO may be required. If pain and dysfunction persist surgery may be needed to fuse the joints of the mid-foot together creating a stable rigid platform to walk on. One thing to remember is that if you have flat feet there is a good chance your children will also. Make sure to have their feet examined early on to prevent future problems. Thanks for reading and remember to follow us on social media including Facebook, Google +and Pinterest!